Hosokawa Alpine is leading in global markets in supplying blown film plastics processing machinery and related equipment, such as extruders, dies, cooling, control, take-off, turret winders, crammer feeders. Hosokawa Alpine is one of the best manufacturers for tailored film production machinery, serving multiple markets for a wide variety of applications like food packaging and shopping bags with their state of the art blown film lines. 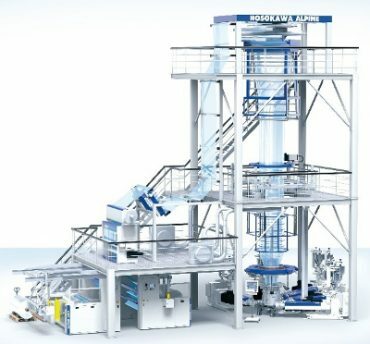 Blow film extrusion lines range from Mono-layers to 3-layer to 11 multi-layer co-extrusion lines. The blown film lines have widths up to 3500 mm. Hosokawa Alpine’s innovative technologies are made with perfection, attention and commitment and has excellence in every smallest detail or operation, designed for customer requirements. •	Mono Axial Film Orientation lines (MDO) – enhances films structure and properties. •	TRIO (Trim Reduction for In-line Orientation) – helps with reduction of trim waste. •	X-Die heads with diameters from 160 up to 710 mm and professionally crafted Individual screen changers. •	Cooling System – guarantees highest output rates. •	AES – an operator friendly and customized Control System with an open architecture. •	Web Handling System (WHS) provides maximum versatility and roll conformity. Standing firm for leading edge technology and the utmost quality in machine building ever since the foundation, Hosokawa Alpine has generated mutual trust and respect among many loyal customers and business partners around the Globe. Euro Machinery APS work as agents for Hosokawa Alpine in Denmark and Sweden. We are proud and happy to work together with a supreme brand, as Hosokawa Alpine is in blown film extrusion. If you are looking to buy a new blown film extruder please contact us here through our website.